Tax collectors, some people love them, most people don’t. But, they’re just doing their job and if it wasn’t for Karl Friedrich Louis Dobermann, we wouldn’t have this loveable and at the same time very intimidating dog in our lives today. Tax collection can be a very stressful and dangerous job, which led Dobermann to develop this breed. He took the best qualities from a lot of breeds and ended up with one fine specimen which is the dog we have today. Some very obvious breeds in the ingredients are: Great Dane, Rottweiler, Greyhound and German Shepherd. And that’s not the end of it, there’s also a Scottish Terrier, Thuringian Shepherd, Beauceron and Weimaraner thrown into the mix to create suc a unique and beautiful breed. Now who says mixing multiple breeds and bloodlines is a bad thing? The Dobermann exudes class in every way. They are medium to large in size and are very tall at the shoulder (owing to the Great Dane bloodline they possess). They also have very distinctive patterns which brings images of Rottweilers into our minds. It should because Rottweilers are part of the ingredients in creating this fine breed. For speed, Dobermann added in some Greyhound bloodline and last but not the least, he incorporated the German Shepherd intelligence which gives this dog the size, strength, speed and smarts to address any perceived threats to the tax collector. Doberman Pinschers for all their intimidating features are actually oversized puppies with their owners. They are very loyal and will do anything to protect his immediate family. Doberman Pinschers possess a very deep chest which makes them a bit top heavy but they are quite graceful in their own way. 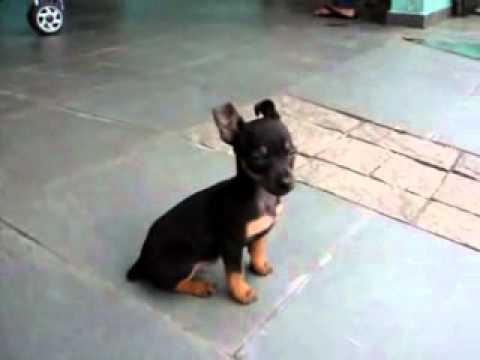 Since this dog is a result of mixing bloodlines from notoriously high energy dogs, you will need to provide a lot of exercise to your Pinscher. As a purebred dog, Dobermans carry a long list of genetic disorders but none are more alarming than Cardiac issues. To avoid this, make sure you provide lots of exercise to your Pinscher so they have the stamina and energy to carry around their extra big hearts. In turn, they’ll love you for a very, very long time. In fact, they’ll give you 10 years of love and loyalty! 0 Doberman Pinscher puppies for sale near you. The Doberman Pinscher dogs puppies for sale are just waiting to be your best friend. The Doberman Pinscher is often thought of as one of the tough guy dogs. The breed in all honesty craves human interaction. The Doberman can play the role of guardian, but it can play the role of most anything you would have it. A German tax collector developed the breed out of sheer necessity. He needed a medium sized dog that could travel easily as he made his collection rounds. He also needed a companion that would be able to handle a bandit with little problem. The Doberman Pinscher was his answer. It is believed that Mr. Louis Doberman succeeded in his breeding efforts in or around 1906. The Doberman Pinscher puppies for sale are the descendants of Mr. Dobermans efforts. 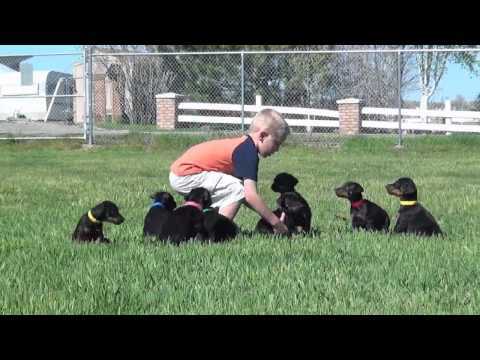 The lineage of the Doberman Pinscher puppies for sale is not exactly known. It is generally accepted that the breed is a derivative of the old shorthair shepherds, the German Pinscher, and the Rottweiler. There are other breeds that are considered by some to have been a part of the makeup, but the previous three are the consensus. No matter what the breeds were the Doberman Pinscher breed is all that Mr. Doberman was hoping for in his quest. 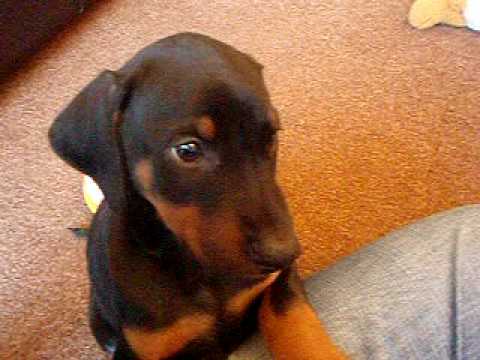 .The Doberman Pinscher puppies will without doubt fill the bill for you as well. Setting consistent boundaries of allowed behavior and establishing your role as the alpha will make things immensely easy. 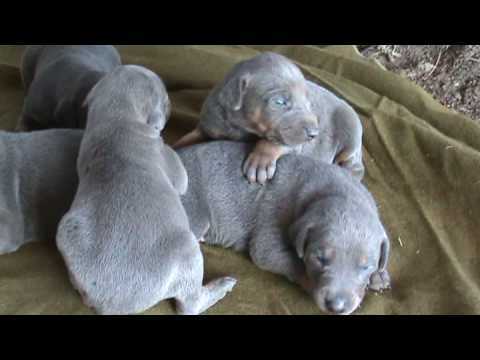 The Doberman Pinscher puppies for sale are very easy to train, and love to please. So, training shouldnt be that difficult if the dog knows what is expected of him and the rules are not constantly being changed. The Doberman Pinschers dogs puppies for sale by nature love to be with their people; so they are natural companions. They love to play and are very energetic so exercise is a must. Interactive activities like fetch or a jog together are mutually beneficial. These dogs are extremely obedient. The dog can be trusted in almost any, if not all situation if proper alpha has been established. The Doberman is a medium size breed but it is on the high end of that classification; another reason for establishing yourself as a consistent alpha. No one wants a dog that may stand up to twenty-eight inches tall and weighing as much as ninety pounds setting the rules. The Doberman Pinscher is know for its strength, its square muscular body is testament to the fact. The Doberman Pinscher dogs puppies for sale are also testament to the breeds love of human interaction. The Doberman Pinscher puppies for sale love to be with its people so it probably will not do well stuck in a kennel in the backyard. This is a family dog It should be kept inside to be a part of the family. You will be amazed at the loyalty, and the intelligence as it becomes a true member of your family. The Doberman Pinscher does not do well in the cold another reason for keeping it inside. The Doberman Pinscher dogs puppies for sale are suitable for any dwelling with the right exercise. 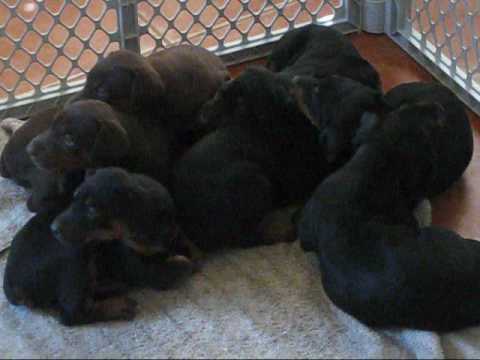 The Doberman Pinscher dogs puppies for sale are really easy keepers. Its smooth coat comes in black with or without tan markings, blue-gray, fawn, red, and even white. The coat needs little grooming. Exercise is a must, but the dog is generally quiet inside, if exercised properly. The only downside of this breed can be health, although the dog on average has a lifespan of thirteen years. The Doberman Pinscher can be prone to a few health issues. Check with your vet. They will be glad to help you with choosing the right Doberman Pinscher. The Doberman Pinscher has been a guardian, companion, therapy dog, tracker and rescue dog. The Doberman Pinscher dogs puppies for sale are waiting for whatever role you have for them in your family. This is a nice way to make your life easier and save time searching for your Doberman Pinscher dog’s puppy for sale. Once your email alert is put in place, all you have to do is check your emails regularly! You can create several email alerts, should you wish to do so.